A hedge is a living wall composed of plants. 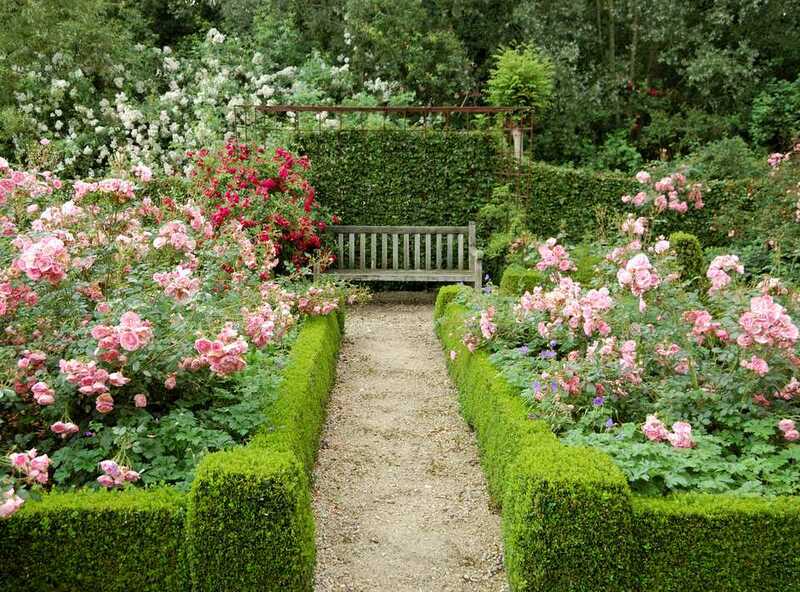 Some hedges are purely decorative, while others serve primarily a practical function. Hedge plants used decoratively are often trimmed to precise sizes and shapes and may be either evergreen or deciduous shrubs. Shrubs used for the practical function of security should be densely growing and possibly have thorns (such as hawthorns) or prickly leaves (such as English holly). Also, hedges are useful as privacy screens and windbreaks. For these two purposes, you need taller shrubs. Japanese holly (Ilex crenata) looks more like a boxwood shrub than holly shrub, bearing small, oval leaves. Many cultivars of this broadleaf evergreen are available. For hedge plants, most people select those that reach 3 to 4 feet in height with a similar spread. English holly (Ilex aquifolium), with its prickly leaves, makes a better hedge plant than Japanese holly, if you wish to combine security with aesthetic considerations. This is one type of holly that grows big enough to serve as a privacy screen (the Ferox Argentea cultivar is 15 feet tall by 8 to 10 feet wide). Another prickly shrub is barberry (Berberis thunbergii). Sharp thorns line the plant's branches, making it a traditional choice for security hedges. As a bonus, its bright red berries offer a decorative component. It is a deciduous shrub, but the berries persist through the cold-weather months to provide visual interest in winter. The thorns are present year-round. 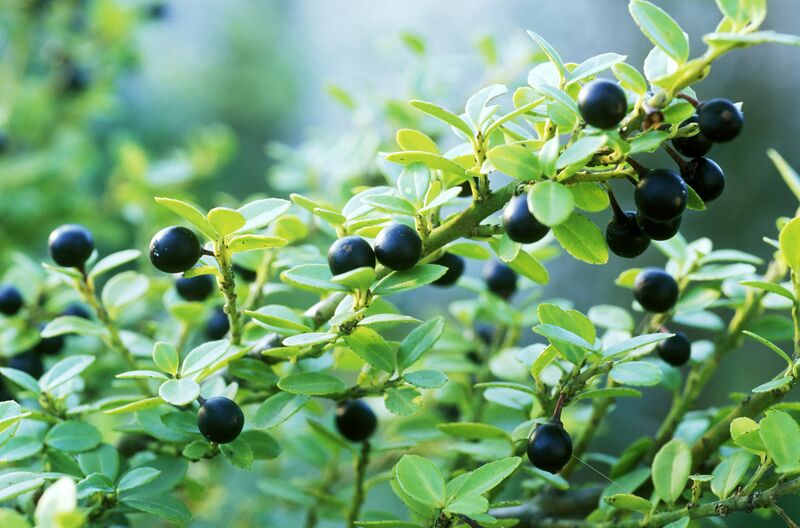 Until recently, barberry had fallen out of favor in North America due to its invasive nature. But the development of new, noninvasive cultivars may lead to a North American barberry revival. Boxwoods (Buxus) are the quintessential hedge plants. These broadleaf evergreens were adored by aristocratic Europeans for centuries as defining elements in formal garden design. North Americans living in deer country have found a new reason to love boxwood hedges: They are deer-resistant shrubs. The mountain laurel (Kalmia latifolia) is another broadleaf evergreen suitable for hedges. One of its best features is that it blooms in late spring to early summer. However, do not try to trim laurels as you would boxwoods. Laurels look best when they are allowed to grow into their natural mature shape. The pink-flowering types are the most popular. Among needle-bearing evergreens, yew bushes (Taxus) are perhaps the most classic hedge plants. They are popular partly because they tolerate shade. While some yews grow tall enough to serve as privacy screens, yews are slow growers. Also, they are too poisonous to grow around children. Deciduous hedge shrubs look great while in bloom but are just so-so during the winter. Also, because they drop their leaves and stand naked for part of the year, deciduous shrubs make for less-than-ideal privacy screens. Lilac bushes (Syringa) are one of your more fragrant choices. To form a hedge with lilacs, simply plant several of them in a line, and do not fuss with making them conform to precise dimensions. Another deciduous shrub commonly found in hedges is the rose of Sharon (Hibiscus syriacus). It is a valuable plant for gardeners wishing to maintain continuous sequence of bloom because it is one of the late-summer flowering shrubs that displays color during a part of the season when many other bushes have already finished blooming for the year. Forsythia bushes (Forsythia x intermedia) are among the first plants to bloom in spring. You probably will not want to prune them as meticulously as you would, say, boxwood. Most people agree that these early-spring flowering shrubs look best when allowed to "have a bad hair day." Like mountain laurels, privets (Ligustrum) are broadleaf shrubs that put out flowers, although their white flowers are not much of a selling point. However, not all varieties of privets are evergreen, and those that are will not necessarily grow well in your zone. Check with your local county extension to see if you can grow evergreen privets in your area. Also, ask if they are invasive in your region. As with privets, azaleas can be either evergreen or deciduous, but their flowers are far superior to those on privets. Stewartstonian azalea (Rhododendron x Gable Stewartstonian) has it all: Its dense branching structure makes it a good hedge plant (in contrast to the Exbury-type azalea, which has a looser branching structure). And, it is a shrub that blooms in early spring and offers good fall color. Azaleas also bear flowers in a range of colors, including red, pink, white, orange, and yellow. Arborvitae shrubs (Thuja) have a dense growth habit that makes them popular privacy screens or windbreaks. There are many types of arborvitae that come in various sizes, shapes, and colors. ​North Pole and Emerald Green are just about the right size for most hedge growers. Green Giant, which can become 60 feet tall, is too big for small properties. Although Canadian hemlocks (Tsuga canadensis) grow as trees in the wild, they are often sold in shrub form for use in hedges. The MacPhail Woods site states, "Prune hemlock lightly but often during the first few growing seasons (two to three times from late June to late August for two to three years). After three years, prune once, in late June, as with white spruce." The site cautions against cutting the leaders until the hemlock hedge or windbreak has attained the height you envisioned for it. Do not prune hedge plants so as to form a wall that is straight up and down. Rather, prune them so that the base is wider than the top (a shape sometimes referred to as an inverted keystone). This will allow sufficient sunlight to reach the growth at the bottom, keeping it healthy.